A large range of bathroom bins and baskets are supplied to suit all sizes of establishments. From a standard white pedal bin to a smart shiny chrome or matt black pedal bin, we can tone with your bathroom décor. Our pedal bins have an anti-scuff plastic base, a good quality stainless steel construction and a removable and easy to clean plastic bucket. Our range of bathroom waste bins are supplied with a luxury vinyl covering, epoxy powder coated steel body, matt steel, faux leather, metal mesh or our modern smart waste paper bins. We have a stylish bathroom bin suitable for your bathroom. Very good quality white finish bathroom Pedal Bin. Removable easy clean plastic inner bucket. Gripped pedal. Lip around top to trap the excess bin liner bag. Ideal for bathrooms and toilets. 3 Litre. - 255mm high. 170mm diameter. 230mm depth. Weight 0.6kg. Sold in Case of 6 only. Very good quality chrome finish bathroom Pedal Bin. Removable easy clean plastic inner bucket. Gripped pedal. Lip around top to trap the excess bin liner bag. Ideal for bathrooms and toilets. 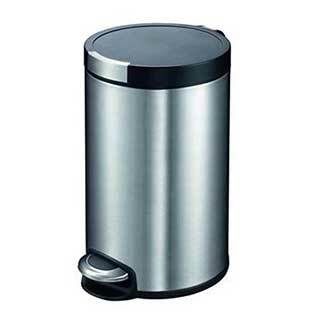 Quality 3 litre bathroom pedal bin in brushed steel with removable easy clean plastic inner bucket. Gripped pedal. Lip around top to trap the excess bin liner bag. Ideal for bathrooms and toilets. Quality 3 litre bathroom pedal bin in polished stainless steel with removable easy clean plastic inner bucket. Ideal for bathrooms and toilets. 3 Litre capacity. Manufacturers 4 year guarantee. 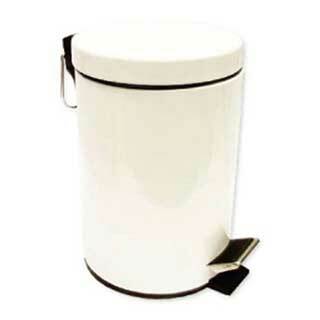 A budget 3 litre bathroom pedal bin in white with removable easy clean plastic inner bucket. Ideal for bathrooms and toilets. Anti-scuff base. 3 litre capacity. Measurements: 25 (h) x 17 (dia.) cm. 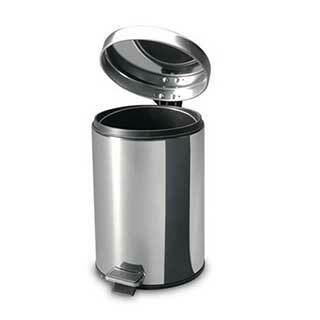 A budget 3 litre bathroom pedal bin in chrome with removable easy clean plastic inner bucket. Ideal for bathrooms and toilets. 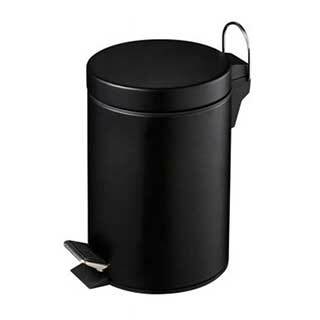 A budget 3 litre bathroom pedal bin in matt black with removable easy clean plastic inner bucket. Ideal for bathrooms and toilets. A budget 3 litre bathroom pedal bin in matt steel with removable easy clean plastic inner bucket. Ideal for bathrooms and toilets. Hotel bathroom 5 litre pedal bin in polished stainless steel . 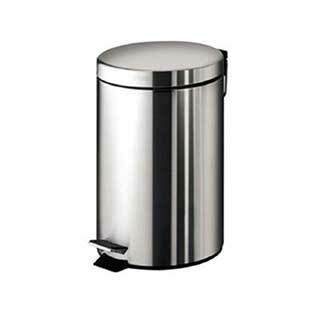 Quality 5 litre bathroom pedal bin in polished stainless steel with removable easy clean plastic inner bucket. Ideal for bathrooms and toilets. Polished stainless steel construction with anti-scuff plastic base. Removable and easy to clean black plastic inner bucket. Anti-scuff black plastic base. 5 Litre Capacity. 4 year manufacturers guarantee. 5 litre bathroom pedal bin in matt steel with black slow close lid. Removable easy clean plastic inner bucket. Ideal for bathrooms and toilets. 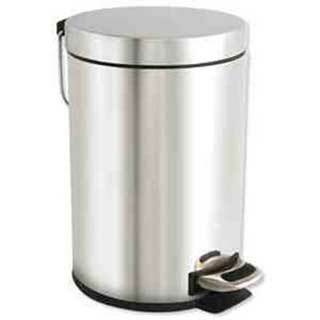 Made from stainless steel with a matt finish this round pedal bin can hold up to 5L of waste. The contrasting black polypropylene lid has a soft close operation and the base has a black anti-scuff edge. 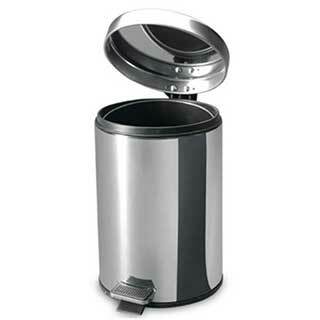 Quality black 3 litre bathroom Pedal Bin. Removable easy clean plastic inner bucket. Gripped pedal. Lip for hiding excess bag. 3 Litre.capacity. 255mm high. 170mm diameter. 230mm depth. Weight 0.6kg. Sold in Case of 6 - £7.99 each.